Middle East Distribution Panel Market size was projected over USD 250 million in 2017 and is anticipated to grow over 7.5% by 2024. Growing deployment of energy efficient electrical systems with an aim to achieve sustainable power output will foster the Middle East distribution panel market. Introduction of energy performance standards and labels by the regulators pertaining to effective monitoring of power consumption will drive the industry growth. In 2010, Dubai Electricity and Water Authority has issued Green Buildings Regulations with an aim to limit the energy consumption in new buildings by 40%. Ongoing investment toward electrification of remote off grid areas by respective government authorities will positively influence the market growth. Increasing electricity demand to carryout oil and gas E&P operations across remote locations will propel the product demand. Ongoing reforms to strengthen economic structure and re-establishment of business environment of war affected levant nations drive the industry growth. Technological advancements supported by increasing investments from various financial institutions including IFC and ADB will encourage the product adoption. In addition, reliability in the power supply and growing concerns toward circuit safety will augment the business outlook. Low voltage distribution panel market accounted for over 14% share in 2017. Growing concentration of urban population coupled with increasing demand for reliable power supply will encourage the product penetration. Increasing government investments towards the development of rural and urban residential infrastructure will positively impact the industry growth. 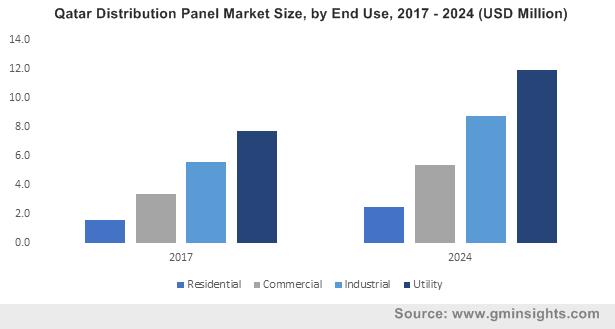 Medium voltage distribution panel market is set to witness growth owing to rising investments toward the development of industrial and commercial establishments including chemical, paper & pulp industry and power generation plants. Favourable government initiatives toward the expansion of existing manufacturing facilities in line of reducing import dependency will further encourage the product adoption. Flush mount distribution panel market is anticipated to grow over 7.5% by 2024. Limited space requirement resulting in optimized execution of product across the residential establishments will positively influence the product adoption. Growing commercialization followed by the aggressive adoption of HVAC systems will further augment the industry landscape. Aggressive expansion of manufacturing facilities along with optimization of MV grids will stimulate the surface mount distribution panel market. Improved efficiency level and high reliability index are some of the prominent features which will boost the product demand. Residential application is set to grow on account of rising urban population pertaining to improvement in standard of living and increasing per capita income. Upsurge in investments by public and private institutions toward real estate sector will further propel the product growth. In 2018, Azizi development has planned to invest USD 2.5 billion toward the development community lifestyle projects in Dubai. Commercial distribution panel market will expand owing to stringent energy conservation norms along with flourishing investments across oil & gas, tourism, chemicals and refinery sectors. Rising focus toward development of smart grid network with an aim to provide efficient & reliable power supply will further enhance the industry outlook. UAE distribution panel market will grow over 5% by 2024. Increasing investments toward construction projects coupled with growing adoption of advanced and sustainable electrical products will positively influence the industry growth. In addition, dynamic islanding, distributed control and development of advanced grid network across the nation are some of the key features which will positively impact the product adoption. Saudi Arabia distribution panel market is set to grow on account of rising population and growing electricity consumption from remote and off-grid areas. Stringent government regulations toward emissions along with upsurge in adoption of sustainable electrical equipment will propel the product adoption. Favorable government initiatives toward strengthening the existing T&D infrastructure coupled with rising demand for uninterrupted and reliable power supply will propel the Egypt distribution panel market. In 2016, the Egyptian Electricity Holding Corporation, invested USD 220 million for the development of the nation’s power distribution network. 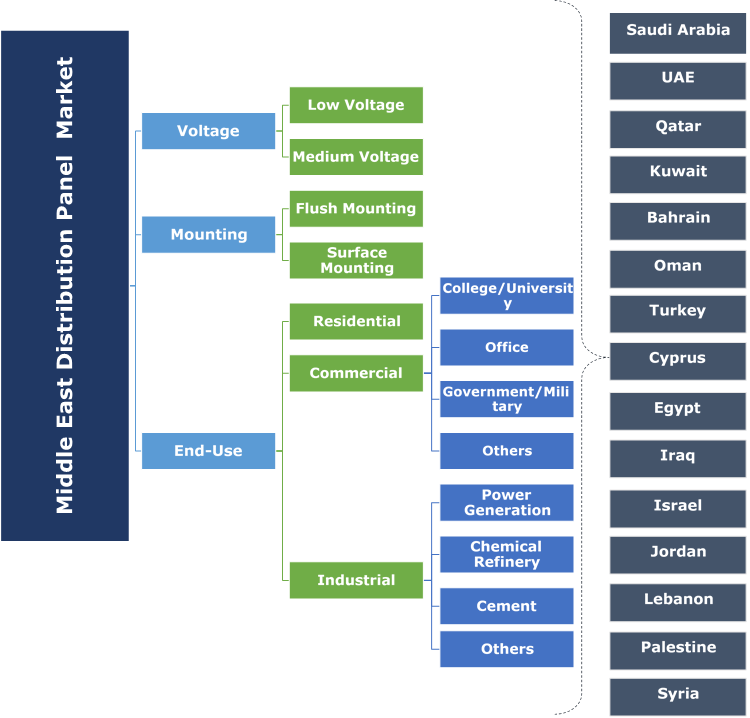 Key industry participants across the Middle East distribution panel market includes Legrand, Schneider Electric SA, Alfanar Group, ABB Limited Abunayyan Holding, EAMFCO, Ba`amer Electric, Hawa Electric Panel Board Factory, Arabian Gulf Switchgear and Hager. Industry players are focussing toward product development, advanced technologies, and reliable and sustainable equipment as their key strategic inference to expand their presence across the nations. In 2016, ABB Limited introduced a preconfigured Remote Power Panel (RPP) for low voltage power supply. RPP helps in meeting the demands of power intensive operations, delivering supreme power supply and monitoring in a space-saving, safe and reliable footprint. The distribution panel is an important component of an electrical network, which serves as a dispersal point and primary safety device. It splits the main feed in supply to subsidiary circuits and prevent the system from overload and short circuit fault, additionally it has provision to isolate the feed and delivery side either manually or by automatic means. Such a panel may consist of fuse, circuit interrupters, bus bar, connection terminal and jumper depending on the specifications and standards.